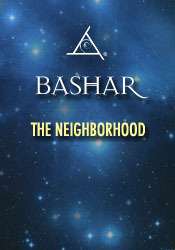 In this vintage session Bashar explains how our galaxy was created, and explains some of the technical details about how and where to find other life forms. He discusses Barnard’s Star, Zeta Reticuli, and other neighboring civilizations, helping us to get a better idea of who where are in context, and how we can prepare ourselves for connectivity with alien civilizations. We get a look at our current state of maturity and evolution, and some ideas of how to move forward, preparation for our future as homo galacticus. New, renewable forms of energy. How belief & thought change your body. Energy exercise to re-align the body. Expressing your purpose in life. Dolphins & dream communication with them. Creating a telepathic link with Bashar. Self judgment & being provoked. Resonance identification & cat symbology. Having spiritual & material wealth.